If the obstacle(s) cannot be visually acquired during departure, preflight planning should take into account what turns or other maneuver(s) may be necessary immediately after takeoff to avoid the obstruction(s). Large and turbine-powered, multiengine transport category airplanes and commuter category airplanes operated under Part 121 or Part 135 have additional takeoff obstacle clearance requirements beyond the scope of the IFR departure procedure requirements addressed by TERPS. Part 25 transport category and Part 23 commuter category airplane certification rules define the one-engineinoperative (OEI) takeoff flight path, which is normally constructed from a series of segments beginning from 35 feet above the runway surface at the end of the OEI takeoff distance and ending at a minimum height of 1,500 feet above the runway elevation. However, the OEI net takeoff flight path assessment may continue above 1,500 feet if necessary to ensure obstacle clearance. Advisory Circular (AC) 120-91, Airport Obstacle Analysis, provides guidance and acceptable criteria for use in determining the safe lateral clearance from obstacles, when developing takeoff and initial climb out airport obstacle analyses and engine out obstacle avoidance procedures to comply with the intent of these regulatory requirements. Pilots departing an airport under IFR and operating under Part 121 or 135 are required by 14 CFR 91.175(f )(4) to use an engine-inoperative takeoff obstacle clearance or avoidance procedure that assures compliance with the obstacle clearance requirements (subpart I) of those rules. The assessment of OEI takeoff obstacle clearance is separate and independent of the IFR departure procedure and associated all-engines-operating climb gradient requirements. While the Part 91 operating rules governing large, commuter, and turbine-powered aircraft do not require the use of an OEI takeoff obstacle clearance or avoidance procedure, such use is encouraged for Part 91 operators of these aircraft. Unlike TERPS, which assesses obstacle clearance beginning at the DER, the OEI net takeoff flight path obstacle assessment begins at the point where the aircraft reaches 35 feet above the runway at the end of the OEI takeoff distance. Therefore, the OEI net takeoff flight path assessment may begin before the DER allowing for the use of a portion of the runway for the OEI climb. The OEI net takeoff flight path obstacle clearance assessment must also account for clearance of the low, close-in obstacles that are noted on the IFR departure procedure, but are not necessarily cleared when complying with the TERPS-based IFR climb gradient. The OEI net takeoff flight path is unique for each aircraft type and is assessed on each takeoff for the required obstacle clearance directly against those obstacles located beneath the OEI flight track and within the prescribed lateral distance from the flight path centerline. 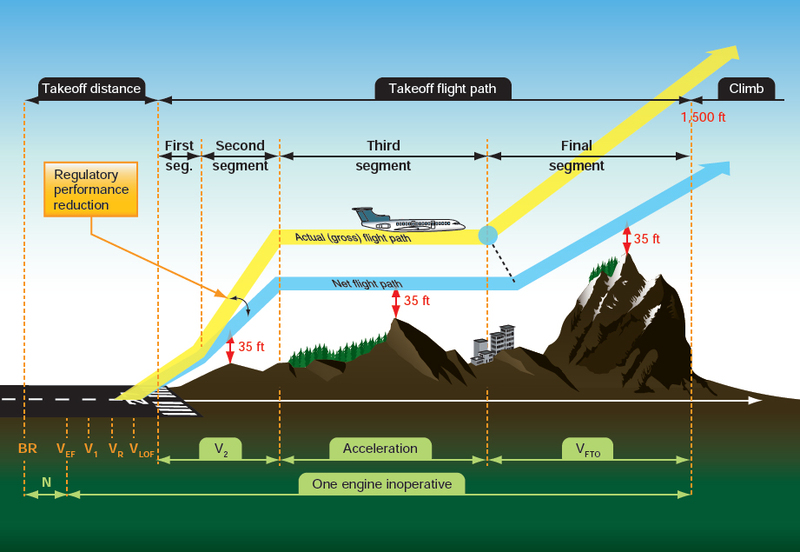 TERPS, on the other hand, provides a required climb gradient that represents a surface that the aircraft’s all-engines-operating climb profile must remain above throughout the IFR climb until reaching the en route environment. These two methods of assessing obstacle clearance are necessarily quite different. TERPS is used by the procedure designer to determine a lateral path that is usable by a wide variety of aircraft types, and establishes a clearance plane that aircraft must be able to stay above to fly the procedure. A Part 25 transport category and Part 23 commuter category aircraft’s OEI takeoff flight path is established by or on behalf of the operator for a particular aircraft type and then limit weights are determined that assure clearance of any obstacles under that flight path (or within the prescribed lateral distance from the flight path centerline). 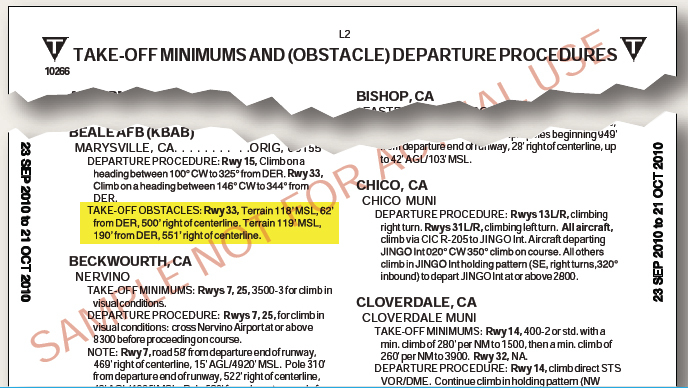 It may be necessary for pilots and operators of these categories of aircraft to use the services of an aircraft performance engineer or airport/runway analysis service provider as means of compliance with the requirements of Part 121 subpart I, or Part 135 subpart I concerning OEI net takeoff flight obstacle clearance and takeoff field length requirements. [Figure 1-20] Airport/runway analysis involves the complex, usually computerized, computations of aircraft performance, using extensive airport/obstacle databases and terrain information. This yields maximum allowable takeoff and landing weights for particular aircraft/engine configurations for a specific airport, runway, and range of temperatures. The computations also consider flap settings, various aircraft characteristics, runway conditions, obstacle clearance, and weather conditions. 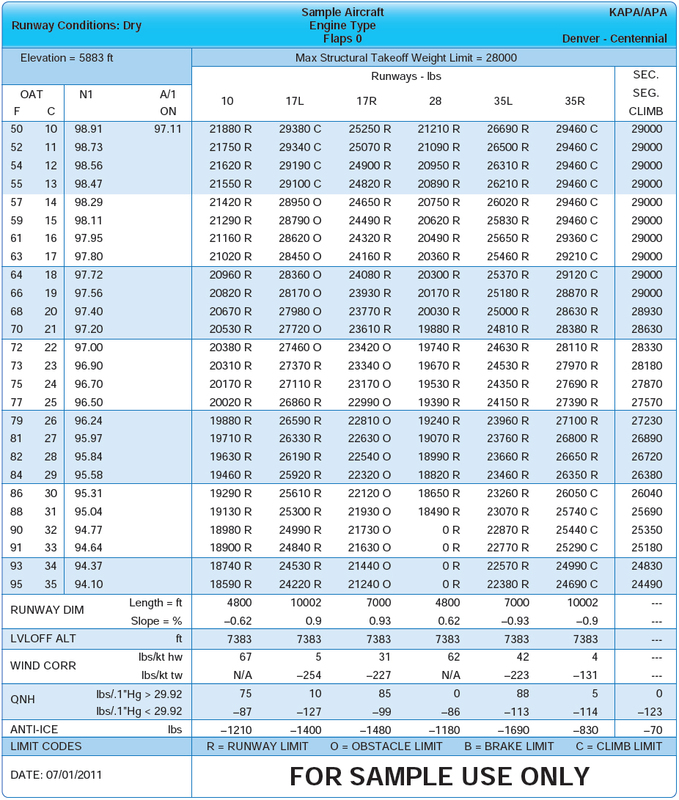 Obstacle data also is available from these service providers for operators who desire to perform their own analysis using the OEI climb performance and flight path data furnished in the Airplane Flight Manual or when using an aircraft electronic performance program supplied by the manufacturer or other service provider. Airport/runway analysis is typically based on the assumption that the pilot will fly a straight-out departure following an engine failure on takeoff. However, when a straight-out departure is not practical or recommended, a special OEI turn procedure can be developed for each applicable runway. This OEI turn procedure may follow the path of a published IFR departure procedure or it may follow an independent path designed to avoid otherwise onerous obstacles and thereby maximize the allowable takeoff weight and payload. Graphic depiction of the OEI procedure is often available to give the pilot a pictorial representation of the special OEI procedure. An engine failure during takeoff is a non-normal condition; therefore, the actions taken by the pilot including the use of an OEI turn procedure takes precedence over noise abatement, air traffic, SIDs, DPs, and other normal operating considerations. It must be understood that the airport/runway analysis assesses obstacle clearance using the OEI net takeoff flight path data provided in the Airplane Flight Manual and the selected lateral obstacle assessment area. A takeoff weight limit provided on the analysis does not necessarily ensure compliance with the all-engines-operating climb gradient published on an IFR departure procedure even if the track of the OEI special procedure and the IFR departure procedure are identical.